Oliver Brown is proud of its racing connections and believes this to be a contributing factor to the recent boost in sales. As an Official Licensee to Royal Ascot, Kristian Ferner Robson has created a capsule Royal Ascot collection of accessories on sale in-store, online and within the Ascot Shops. Oliver Brown will be present within the Royal Enclosure and Queen Anne Enclosure for all five days of Royal Ascot. Not to mention featuring within the Cedar Tree and Parade Ring Shops for the remainder of the Flat season. 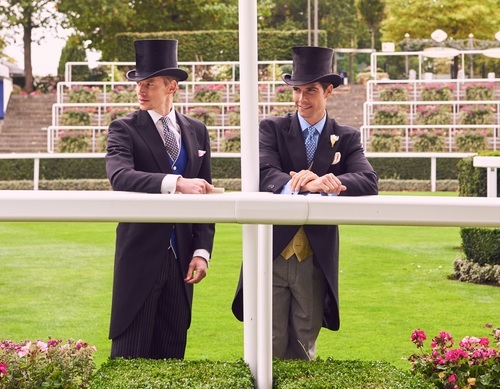 You can find Oliver Brown top hats and morningwear within the Official Royal Ascot Style Guide. Boasting the largest independent collection of top hats in the country, Oliver Brown provide exclusive ‘top shelf’ antique pieces – a must-have in order to gain access to the Royal Enclosure. Famous fans include Damien Lewis, John Goodman, Rory Bremner, Ant and Dec, and this year, they’re also proud to be dressing a number of the racing elite, including world renowned trainers Adian O’Brien, Archie Watson, Hugo Palmer and Richard Hannon. Oliver Brown are also thrilled to be dressing ITV racing presenter Ed Chamberlin and fashion stylist Mark Heyes. Oliver Brown is the home to classic British menswear and the country’s oldest independent top hat specialist. Oliver Brown’s flagship store in the heart of Chelsea, London is the ultimate destination for quintessentially British ready-to-wear morning and eveningwear, shooting and country clothing, luxury accessories, and formalwear hire. Oliver Brown’s tailoring services brings together thirty-five years of experience as a gentleman’s outfitter, with the skills of their in-house tailor, to provide British made bespoke, semi-bespoke and made to order. To shop the collection visit www.oliverbrown.org.uk or call 020 7259 9494. This press release was distributed by ResponseSource Press Release Wire on behalf of Bloxham PR in the following categories: Men's Interest, Business & Finance, Retail & Fashion, for more information visit https://pressreleasewire.responsesource.com/about.